Adult Terry Bibs are made of soft absorbent polycotton terry with full waterproof vinyl backing. Full waterproof vinyl backing helps to keep clothing dry and clean. Save time and money on laundry and dry cleaning. Snap or hook-and-loop (Velcro TM) bib closures. 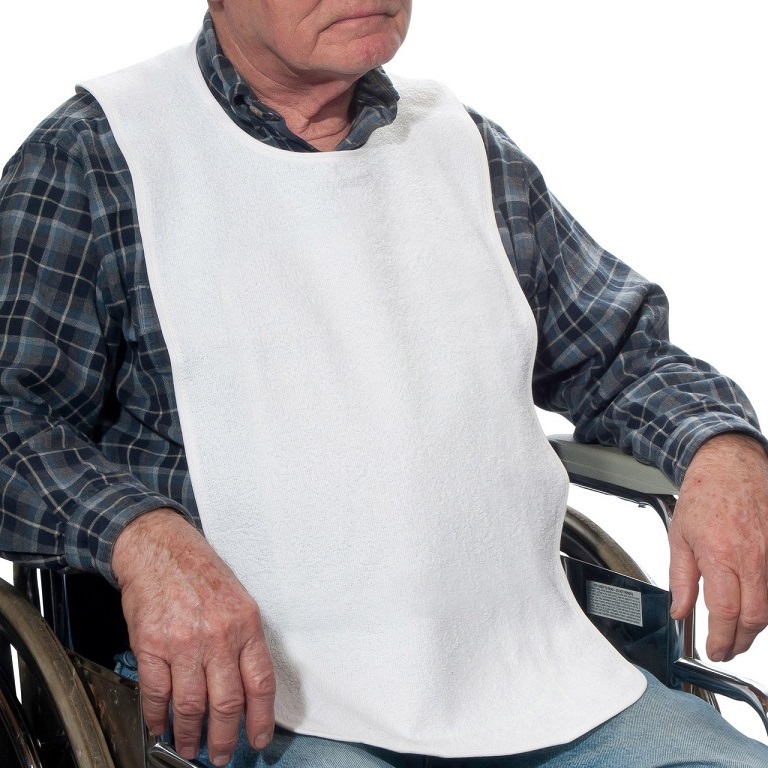 The Adult Terry Bibs help protect clothing during meals, activities or when taking medications. 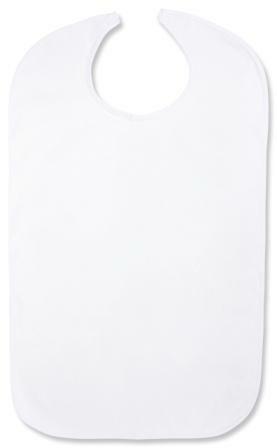 These large sized adult bibs measure 18 inches wide and 30 inches long to provide better clothing protection. 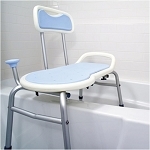 The bibs are made of long wearing absorbent poly cotton terry cloth fused to waterproof vinyl backing and are reinforced with cotton bias trim. 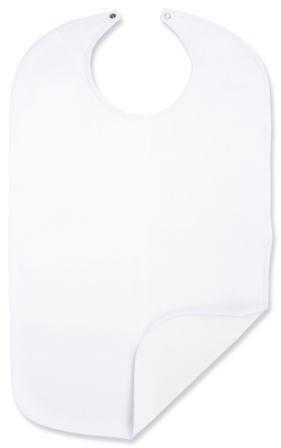 Caregivers will find using these Adult Terry Bibs helps save time and money on laundry and dry cleaning. Laundering instructions: Machine wash, don't use chlorine bleach, dry bibs at 150 degrees or lower. Bleach and high heat drying will harden and crack the vinyl waterproof layer of the bibs. Measure: 18 inches wide, 30 inches long. Materials: Terry cloth cotton front with full waterproof backing. 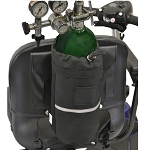 Neck closure: Snap or Velcro® (hook and loop). Includes: One bib per package. Care: Machine washable. Do not use chlorine bleach. Machine dry 150 degrees or lower. 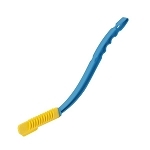 EXCELLENT, SAVES ALL OF YOUR CLOTHES AND ALOT CHEAPER THAN STAIN FIGHTERS. easy to put on alone, the coverage provided is more than adequate. My husband is a large/tall man. This bib is the perfect size. Washes up well too. Q: What are the measurements of this bib ? A: Bibs Measure: 18 inches wide, 30 inches long. Q: Are your adult bibs machine washable? A: yes, Machine washable. Do not use chlorine bleach. Machine dry 150 degrees or lower. Q: Do the bibs come in colors? A: Not this particular item, but we do have colored terry bibs. 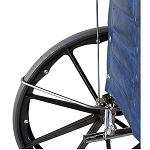 See the section - Bibs and Clothing Protectors - for more options. Q: What is hook and loop? A: Hook and Loop is the same as Velcro. A: Yes - Machine washable. Do not use chlorine bleach. Machine dry 150 degrees or lower. Q: Are these bibs the same you have sold for years? I purchased some of them 15 or so years ago and am still using them with weekly washing and drying. A: We have sold this particular bib for a long time. We are not 100% sure it is the same as 15 years ago, but believe it is. Q: I have a daughter age 27 who is very petite. I need waterproof bibs that are not too long as to hut her knees. Do you have samples?? A: We currently do not have samples available. 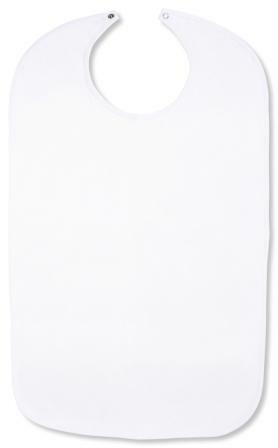 A: This particular product # only comes in White, however, we offer several other Adult Bibs in different colors. Product #: CIB110B is the Adult Size Terry Bib in Blue. 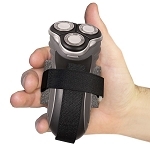 Q: Do these come as a set of or individually? A: The Adult Terry Bibs come one to a package.